Growing up around wellness, Dr. Kulik had the opportunity to see firsthand how effective chiropractic care could be. His father, an All-American track and field athlete, received regular chiropractic care to remain healthy and prevent injury. During a visit to the chiropractor with his father at the age of 7, Dr. Kulik received his first adjustment. Every time he returned to the chiropractor with his father, he noticed patients waiting to receive care who were in extreme pain, but would walk out after an adjustment with a newfound spirit of health. 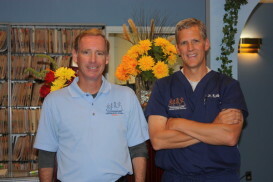 Dr. McLaughlin was born into an athletic, health oriented family. His Dad, a former Division 1 Basketball player and coach for over 30 years in NY. His Mom, an immigrant from Ireland rose to become a Registered Nurse who eventually ran a Cardiac ICU unit at Stony Brook Hospital on Long Island, NY. Dr. McLaughlin and his 4 siblings were raised in an atmosphere of fitness and health.